Do you want a unique needlepoint canvas that has special meaning for you or the person you are making it for? Creating custom needlepoint canvases has never been easier. There are some great websites out there explaining how to paint a needlepoint canvas. But, if you are interested in designing your own canvas and then having someone else make it for you, then you should read this. 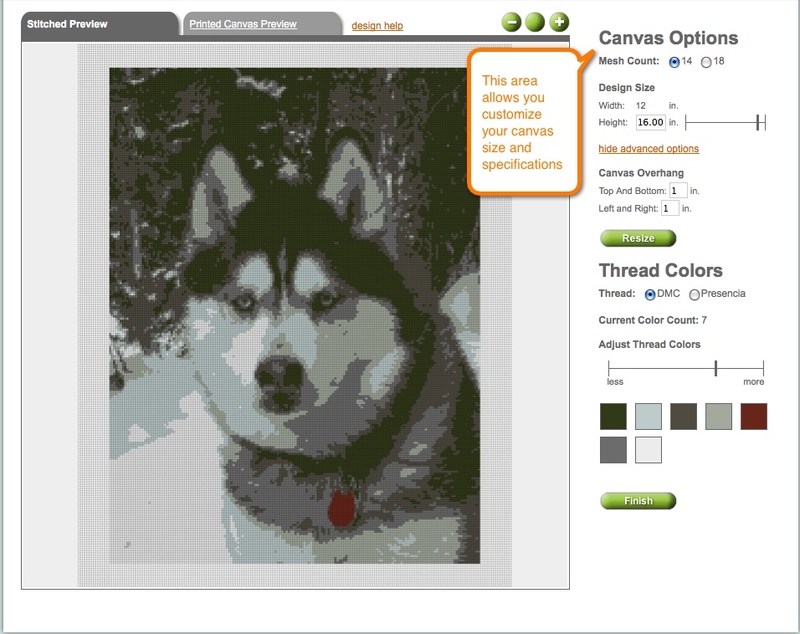 Basically, Needlepaint.com allows users to design a needlepoint canvas online, and preview the design before placing an order. Please note, our canvases are not hand painted, as we find that we can get more accurate photo details using digital artwork than doing it by hand. Hopefully if you found this blog, you already have something in mind. If you want more needlepoint design ideas please review our entire blog. Really any artwork or photo will work, as long as it is saved as a .jpg, .png or .gif file on your computer. If you have a photo that is not yet digital you can go to a local copy store and have them scan it and save it for you, or you can mail it to us. If you want us to help do the digital artwork for you, please contact us. 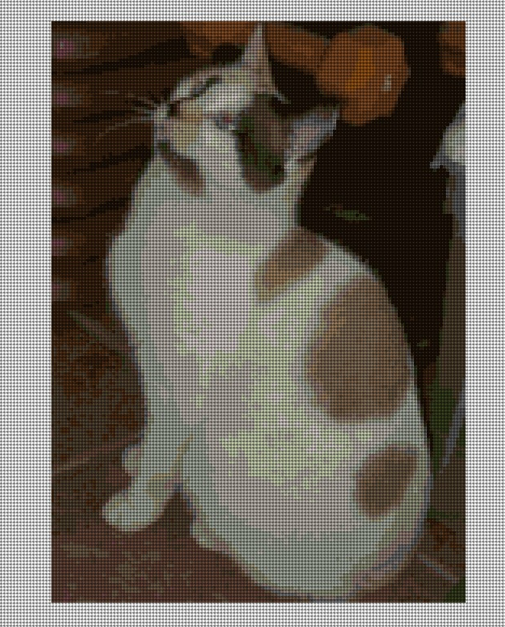 For most photo’s, you may not want to stitch the entire image, but the exact size is not important. The key is to get close in on the subject, especially if the canvas is smaller than 10″ x 10″. If you are making a pillow, kindle cover, or other “functional” type needlepoint project, you will want to be sure to make your image the right scale to fit exactly to your project. An example: if you are making a 12 x 12 pillow, then you will want to be sure your image is square. If you are making a Kindle Cover, then you will want your image to be 6″ high, and 2″ wide or an equally proportioned size so the needlepoint canvas will be 18″ x 6″. OK, so you have a photo, but you don’t want to stitch all the background, or you have an exact size you want to design. 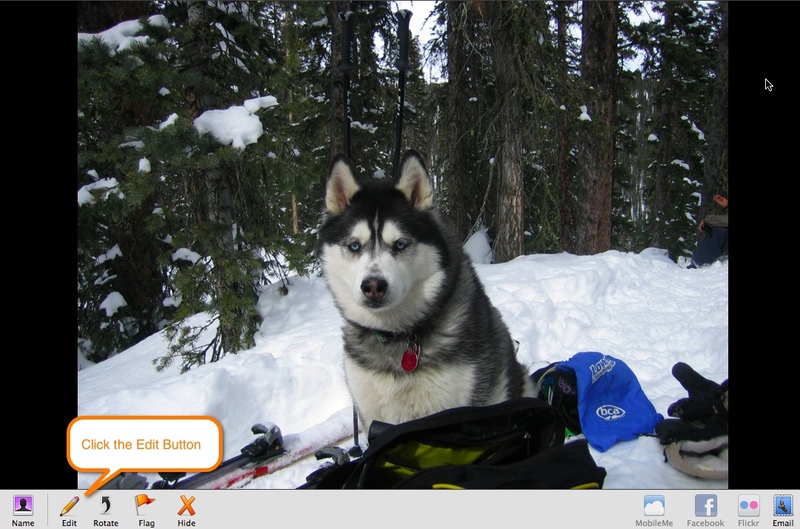 In many of the photo viewing software, there is a Crop feature. 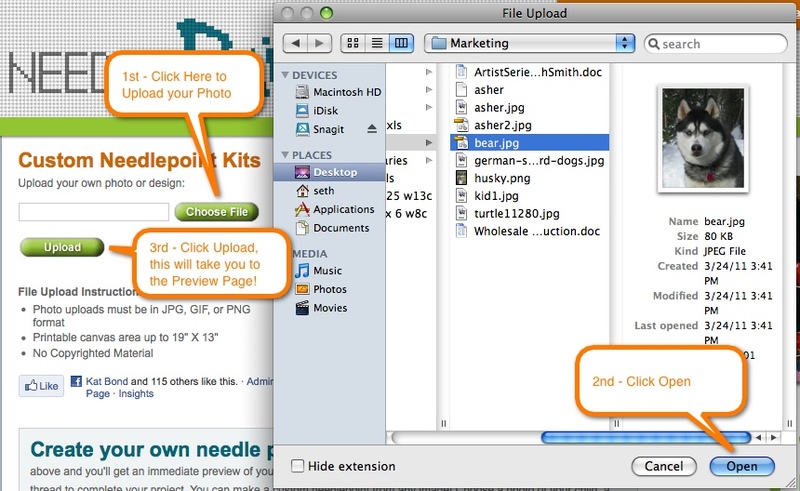 This will allow you to select only the part of the image you want on your canvas. ***In the example below we actually did a 12″ x 16″ rectangle. This means that we need to be sure we use a rectangle of around 3″ x 4″. Once you have the image ready, you can go to NeedlePaint.com to create your custom needlepoint canvas. Now you can see your own design in Needlepoint! You will automatically be taken to our “Stitched Preview” which shows an approximation of how your canvas will look once you stitch it. There are many adjustments on this page, please read below, we will explain each. Mesh Count: This is a very important feature. 18 mesh will show more details, but has many more holes per inch (324 holes to stitch vs 196 stitches in 14 mesh). 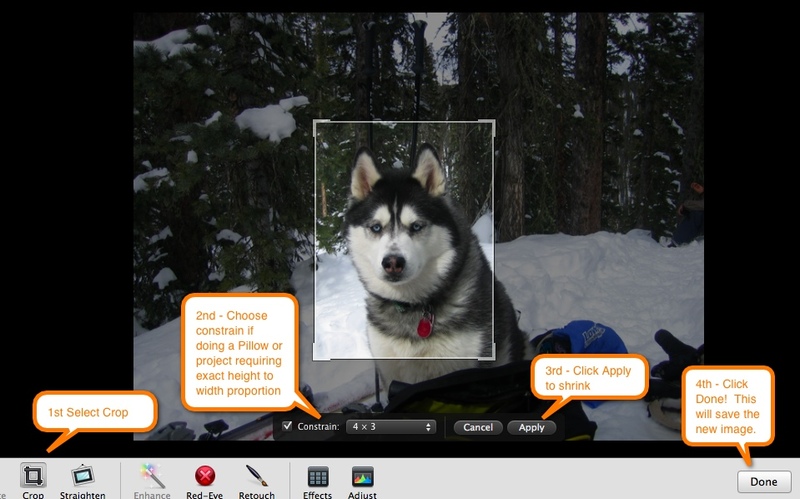 If you are doing a smaller canvas, 18 mesh will help capture more detail from your photo. (We also are able to supply 8, 10, and 12 mesh, but these need to be special ordered). Design Size: Here you can select your height or width. Please note, this will keep the exact same proportions as your original photo, if you want to adjust it, please go back and read the “Step Three – Cropping Your Artwork” section in this blog. 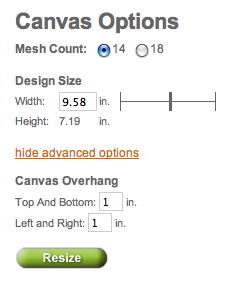 Advanced Options: This allows you to order a larger canvas. Normally or canvases include 1″ of extra canvas on all sides, but if you want more blank canvas, you need make the adjustment here. Thread Colors: Another very important feature allows you to select the number of colors you will use on your needlepoint project. 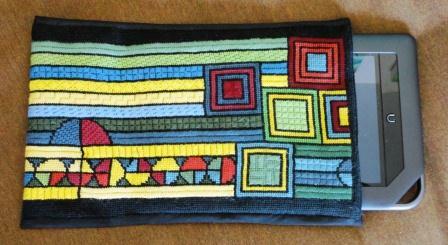 We suggest reducing the number of colors as much as possible to make it easier to stitch but where it still looks good. If you are very experienced needlepointer, have lots of floss hanging around, and don’t mind using lots of colors, than by selecting a high number of colors, you will get more details onto the canvas. To adjust the color, click the line on the right or left of the bar. Thread Type: You can also adjust the type of threads. Since we match digital colors to real floss colors, the DMC and Presencia will show different results in the preview. DMC is often better for images of people because there are a lot more flesh tone colors to pick from. (If you are ordering floss from us, you will also notice that fewer colors is less expensive). 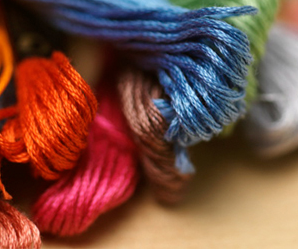 Please note, we do not supply wool, as the color options are very limited, but it can be used on any project. Click Finish to see pricing. You can also view our price chart before uploading an image if you want approximate pricing details. It is never too early to start planning for Christmas particularly if there are several little ones in your family. 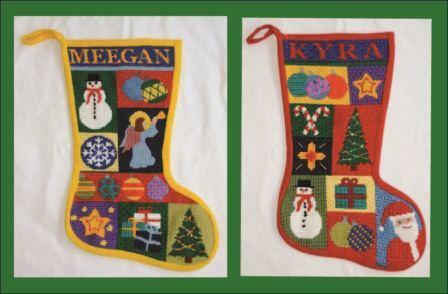 There are nine little ones in my extended family circle, and each now has his or her custom needlepoint Chirstmas stocking printed by Needlepaint and lovingly stitched by me. My first two stockings were stitched with the traditional Continental Stitch. After that I got creative and used a variety of different stiches as shown in the completed stocking below. To finish the stockings, I lined the canvas with red cotton and then made the back of the stock out of red wool cut on the bias so there was some give to allow for more goodies to be stuffed in by Santa. These design are available on our Etsy NeedlePaint Shop and can be customize with your name(s) on the checkout page. Please limit names to 12 letters. 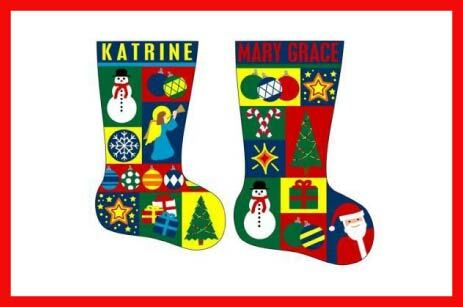 Stocking design is printed on Zweigart Mono 14 point , and is 16” x 10.25″. And more designs are coming soon! 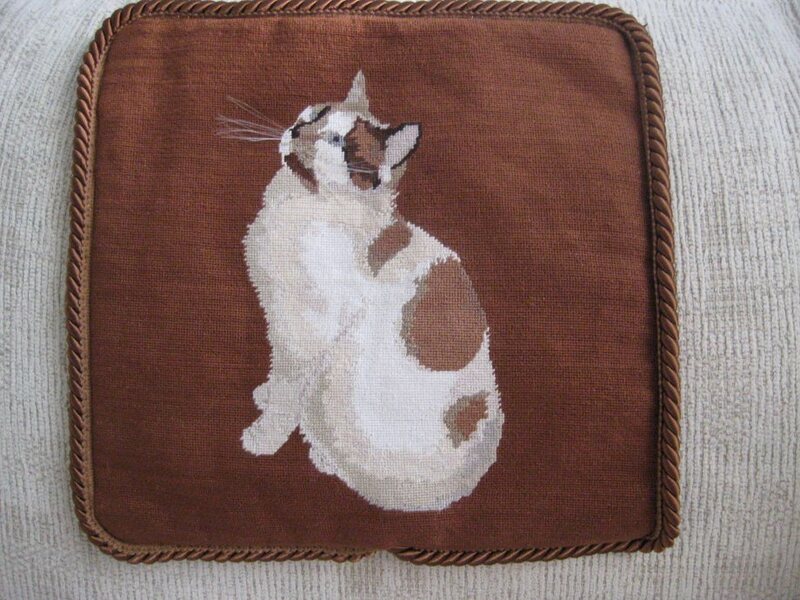 I worked with Susan Segalla a few months ago, to resize two of her photos of her kats (Josie and Tinker) to make into 12 x 12 needlepoint cat pillows. She ordered two needlepoint canvases. We discussed removing the background, but she thought it would be no problem for her to stitch over it. See the image below, it was 10″ high, but we changed the “Advanced Settings” so the canvas would be 14 x 14. Look how great Susan’s pillow looks! 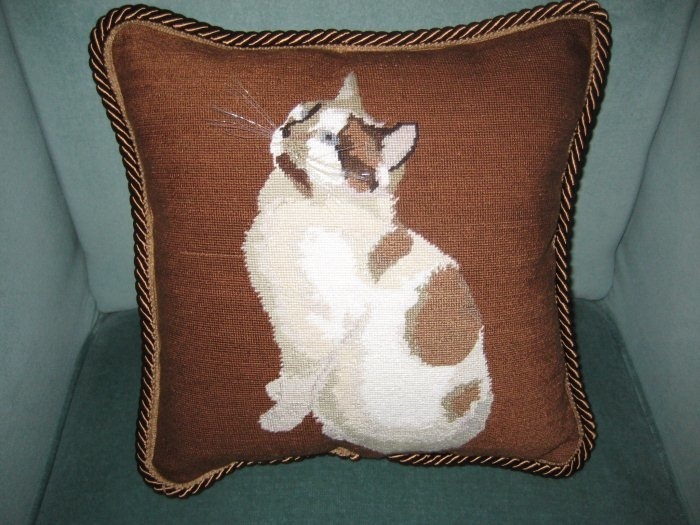 She found a great brown rope trim, and matching faux sweud backing, but the other thing I love are the whiskers! She made them from paint brush bristles. If you are looking to make a needlepoint pillow, Peggy wrote a blog about needlepoint pillows that would be good to read. Do you have any good links for making pillow’s for other stitchers? Please add your links in the comments to this post! After finishing my first e book cover, I sat down with my Needlepaint partners to discuss design and construction. Assembling the first cover was not so simple as it could have been. Voila! We came up with a simple to assemble design which used the magnets in the Nook box as closures. For this second Nook cover, the Needlepoint canvas was 5-1/2” by 18” designed by one of our partners and far more intricate than my previous. I had fun needlepointing this canvas as I could use lots of different stitches. Once stitched and blocked, I cut the black cotton lining material to 6-1/2” by 20”, which includes a ½” seam allowance on the sides and a 1” allowance on the ends. With right sides together, sew the lining and needlepoint canvas together along last row of thread. This should leave an approximate 1” seam allowance on the lining. 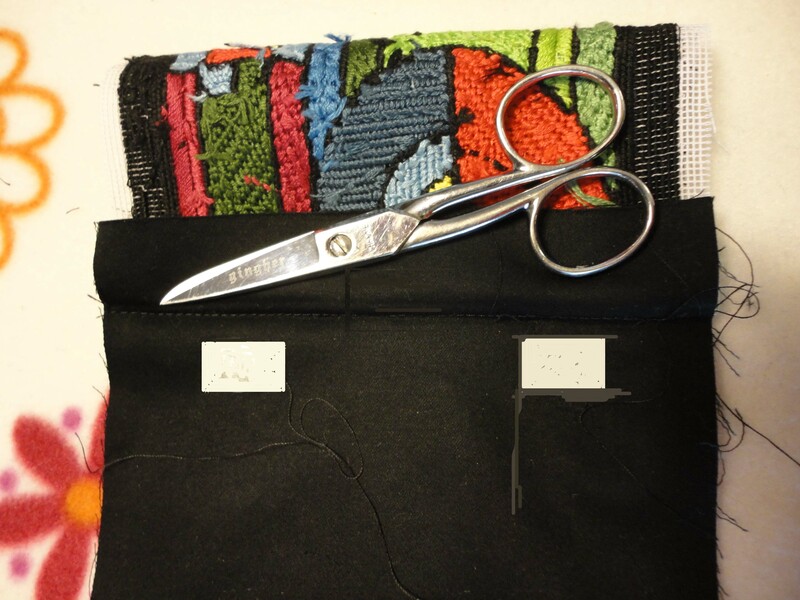 Trim canvas to ½” , turn, and fold along seam line. Place magnets as shown on template above and stitch around each to hold them in place. With magnets in place and work turned to right side, sew side seams along finished end of the canvas. Trim to ¼” and bind with matching bias tape. Replace the bias tape with a fancy braid — my suggestion which was overruled by my Needlepaint partner who will be using the cover. Add handle which my 93-year old mother is convinced is essential. Eliminate the bias binding by making the Needlepaint canvas 1/2″ wider. Fold canvas in half width-wise with wrong side showing. Sew side seams, trim to 1/4″, and turn. Repeat for lining, but do not turn. Fold lining over 1″ to the outside and place magnet or other closure option. Insert lining into Needlepaint cover and sew linig to canvas. If your e-reader is not a Nook and you don’t have magnets, the closure could also be made with Velcro which is available in several different colors and as self-adhesive or sew-on varieties. 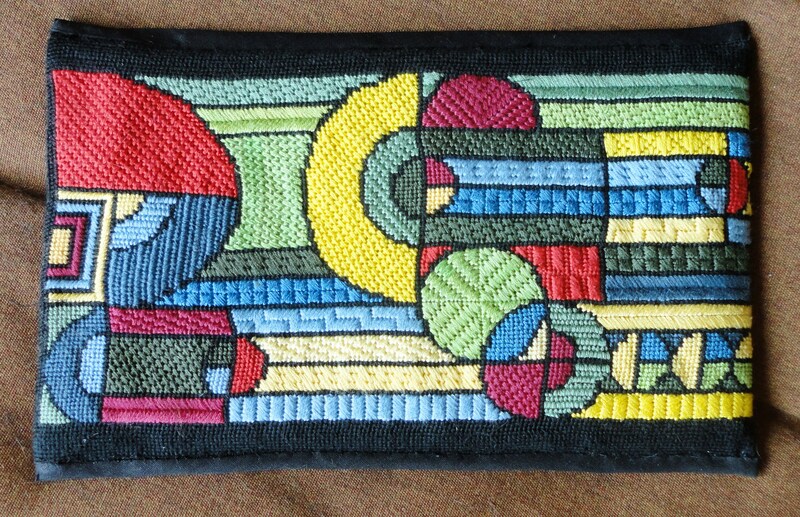 Create your own custom needlepoint cover at NeedlePaint.com !